Ancient Egyptian technology describes devices and technologies invented or used in Ancient Egypt. The Egyptians invented and used many simple machines, such as the ramp and the lever, to aid construction processes. They used rope trusses to stiffen the beam of ships. Egyptian paper, made from papyrus, and pottery were mass-produced and exported throughout the Mediterranean basin. The wheel was used for a number of purposes, but chariots only came into use after the Second Intermediate period. The Egyptians also played an important role in developing Mediterranean maritime technology including ships and lighthouses. Significant advances in ancient Egypt during the dynastic period include astronomy, mathematics, and medicine. Their geometry was a necessary outgrowth of surveying to preserve the layout and ownership of farmland, which was flooded annually by the Nile river. The 3,4,5 right triangle and other rules of thumb served to represent rectilinear structures, and the post and lintel architecture of Egypt. Egypt also was a center of alchemy research for much of the western world. The word paper comes from the Greek term for the ancient Egyptian writing material called papyrus, which was formed from beaten strips of papyrus plants. Papyrus was produced as early as 3000 BC in Egypt, and sold to ancient Greece and Rome. 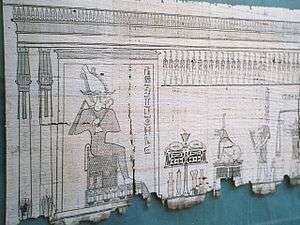 The establishment of the Library of Alexandria limited the supply of papyrus for others. As a result, according to the Roman historian Pliny (Natural History records, xiii.21), parchment was invented under the patronage of Eumenes II of Pergamon to build his rival library at Pergamon. This however is a myth; parchment had been in use in Anatolia and elsewhere long before the rise of Pergamon. Egyptian hieroglyphs, a phonetic writing system, served as the basis for the Phoenician alphabet from which later alphabets were derived. With this ability, writing and record keeping, the Egyptians developed one of the —if not the— first decimal system. The city of Alexandria retained preeminence for its records and scrolls with its library. That ancient library was damaged by fire when it fell under Roman rule, and was destroyed completely by 642 CE. With it, a huge amount of antique literature, history, and knowledge was lost. Some of the older tools used in the construction of Egyptian housing included reeds and clay. According to Lucas and Harris, “reeds were plastered with clay in order to keep out of heat and cold more effectually”. Other tools that were used were "limestone, chiseled stones, wooden mallets, and stone hammers". With these tools, ancient Egyptians were able to create more than just housing, but also sculptures of their gods, goddesses, pyramids, etc. Many temples from Ancient Egypt are not standing today. Some are in ruin from wear and tear, while others have been lost entirely. The Egyptian structures are among the largest constructions ever conceived and built by humans. They constitute one of the most potent and enduring symbols of Ancient Egyptian civilization. Temples and tombs built by a pharaoh famous for her projects, Hatshepsut, were massive and included many colossal statues of her. Pharaoh Tutankamun's rock-cut tomb in the Valley of the Kings was full of jewellery and antiques. In some late myths, Ptah was identified as the primordial mound and had called creation into being, he was considered the deity of craftsmen, and in particular, of stone-based crafts. Imhotep, who was included in the Egyptian pantheon, was the first documented engineer. The Lighthouse of Alexandria on the island of Pharos. In Hellenistic Egypt, lighthouse technology was developed, the most famous example being the Lighthouse of Alexandria. Alexandria was a port for the ships that traded the goods manufactured in Egypt or imported into Egypt. A giant cantilevered hoist lifted cargo to and from ships. 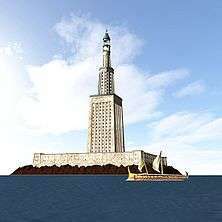 The lighthouse itself was designed by Sostratus of Cnidus and built in the 3rd century BC (between 285 and 247 BC) on the island of Pharos in Alexandria, Egypt, which has since become a peninsula. This lighthouse was renowned in its time and knowledge of it was never lost. A 2006 drawing of it created from the study of many references, is shown at the right. The Nile valley has been the site of one of the most influential civilizations in the world with its architectural monuments, which include the pyramids of Giza and the Great Sphinx—among the largest and most famous buildings in the world. 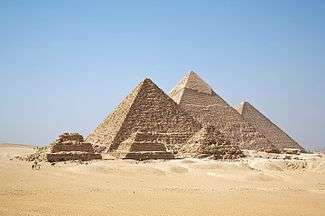 The most famous pyramids are the Egyptian pyramids—huge structures built of brick or stone, some of which are among the largest constructions by humans. Pyramids functioned as tombs for pharaohs. In Ancient Egypt, a pyramid was referred to as mer, literally "place of ascendance." The Great Pyramid of Giza is the largest in Egypt and one of the largest in the world. The base is over 13 acres (53,000 m2) in area. It is one of the Seven Wonders of the World, and the only one of the seven to survive into modern times. The Ancient Egyptians capped the peaks of their pyramids with gold and covered their faces with polished white limestone, although many of the stones used for the finishing purpose have fallen or been removed for use on other structures over the millennia. The Red Pyramid of Egypt (c.26th century BC), named for the light crimson hue of its exposed granite surfaces, is the third largest of Egyptian pyramids. Menkaure's Pyramid, likely dating to the same era, was constructed of limestone and granite blocks. The Great Pyramid of Giza (c. 2580 BC) contains a huge granite sarcophagus fashioned of "Red Aswan Granite." The mostly ruined Black Pyramid dating from the reign of Amenemhat III once had a polished granite pyramidion or capstone, now on display in the main hall of the Egyptian Museum in Cairo (see Dahshur). Other uses in Ancient Egypt, include columns, door lintels, sills, jambs, and wall and floor veneer. The ancient Egyptians had some of the first monumental stone buildings (such as in Sakkara). How the Egyptians worked the solid granite is still a matter of debate. Archaeologist Patrick Hunt has postulated that the Egyptians used emery shown to have higher hardness on the Mohs scale. Regarding construction, of the various methods possibly used by builders, the lever moved and uplifted obelisks weighing more than 100 tons. Obelisks were a prominent part of the architecture of the ancient Egyptians, who placed them in pairs at the entrances of various monuments and important buildings, such as temples. In 1902, Encyclopædia Britannica wrote, "The earliest temple obelisk still in position is that of Senusret I of the XIIth Dynasty at Heliopolis (68 feet high)". The word "obelisk" is of Greek rather than Egyptian origin because Herodotus, the great traveler, was the first writer to describe the objects. Twenty-nine ancient Egyptian obelisks are known to have survived, plus the unfinished obelisk being built by Hatshepsut to celebrate her sixteenth year as pharaoh. It broke while being carved out of the quarry and was abandoned when another one was begun to replace it. The broken one was found at Aswan and provides the only insight into the methods of how they were hewn. The obelisk symbolized the sky deity Ra and during the brief religious reformation of Akhenaten, was said to be a petrified ray of the Aten, the sun disk. It is hypothesized by New York University Egyptologist Patricia Blackwell Gary and Astronomy senior editor Richard Talcott that the shapes of the ancient Egyptian pyramid and Obelisk were derived from natural phenomena associated with the sun (the sun-god Ra being the Egyptians' greatest deity). It was also thought that the deity existed within the structure. The Egyptians also used pillars extensively. It is unknown whether the Ancient Egyptians had kites, but a team led by Maureen Clemmons and Mory Gharib raised a 5,900-pound, 15-foot (4.6 m) obelisk into vertical position with a kite, a system of pulleys, and a support frame. Maureen Clemmons developed the idea that the ancient Egyptians used kites for work. Ramps have been reported as being widely used in Ancient Egypt. A ramp is an inclined plane, or a plane surface set at an angle (other than a right angle) against a horizontal surface. The inclined plane permits one to overcome a large resistance by applying a relatively small force through a longer distance than the load is to be raised. In civil engineering the slope (ratio of rise/run) is often referred to as a grade or gradient. An inclined plane is one of the commonly-recognized simple machines. Maureen Clemmons subsequently lead a team of researchers demonstrating a kite made of natural material and reinforced with shellac (which according to their research pulled with 97% the efficiency of nylon), in a 9 mph wind, would easily pull an average 2-ton pyramid stone up the 1st two courses of a pyramid (in collaboration with Cal Poly, Pomona, on a 53-stone pyramid built in Rosamond, CA). The Ancient Egyptians had knowledge to some extent of sail construction. This is governed by the science of aerodynamics. The earliest Egyptian sails were simply placed to catch the wind and push a vessel. Later Egyptian sails dating to 2400 BCE were built with the recognition that ships could sail against the wind using the side wind. Queen Hatshepsut oversaw the preparations and funding of an expedition of five ships, each measuring seventy feet long, and with several sails. Various others exist, also. Ancient Egyptians had experience with building a variety of ships. Some of them survive to this day as Khufu Solar ship. The ships were found in many areas of Egypt as the Abydos boats and remnants of other ships were found near the pyramids. Sneferu's ancient cedar wood ship Praise of the Two Lands is the first reference recorded to a ship being referred to by name. Although quarter rudders were the norm in Nile navigation, the Egyptians were the first to use also stern-mounted rudders (not of the modern type but center mounted steering oars). Egyptian knowledge of glassmaking was advanced. The earliest known glass beads from Egypt were made during the New Kingdom around 1500 BC and were produced in a variety of colors. They were made by winding molten glass around a metal bar and were highly prized as a trading commodity, especially blue beads, which were believed to have magical powers. The Egyptians made small jars and bottles using the core-formed method. Glass threads were wound around a bag of sand tied to a rod. The glass was continually reheated to fuse the threads together. The glass-covered sand bag was kept in motion until the required shape and thickness was achieved. The rod was allowed to cool, then finally the bag was punctured and the sand poured out and reused . The Egyptians also created the first colored glass rods which they used to create colorful beads and decorations. They also worked with cast glass, which was produced by pouring molten glass into a mold, much like iron and the more modern crucible steel. The Egyptians were a practical people and this is reflected in their astronomy in contrast to Babylonia where the first astronomical texts were written in astrological terms. Even before Upper and Lower Egypt were unified in 3000 BCE, observations of the night sky had influenced the development of a religion in which many of its principal deities were heavenly bodies. In Lower Egypt, priests built circular mud-brick walls with which to make a false horizon where they could mark the position of the sun as it rose at dawn, and then with a plumb-bob note the northern or southern turning points (solstices). This allowed them to discover that the sun disc, personified as Ra, took 365 days to travel from his birthplace at the winter solstice and back to it. Meanwhile, in Upper Egypt a lunar calendar was being developed based on the behavior of the moon and the reappearance of Sirius in its heliacal rising after its annual absence of about 70 days. After unification, problems with trying to work with two calendars (both depending upon constant observation) led to a merged, simplified civil calendar with twelve 30-day months, three seasons of four months each, plus an extra five days, giving a 365-year day but with no way of accounting for the extra quarter day each year. Day and night were split into 24 units, each personified by a deity. A sundial found on Seti I's cenotaph with instructions for its use shows us that the daylight hours were at one time split into 10 units, with 12 hours for the night and an hour for the morning and evening twilights. However, by Seti I's time day and night were normally divided into 12 hours each, the length of which would vary according to the time of year. Key to much of this was the motion of the sun god Ra and his annual movement along the horizon at sunrise. Out of Egyptian myths such as those around Ra and the sky goddess Nut came the development of the Egyptian calendar, time keeping, and even concepts of royalty. 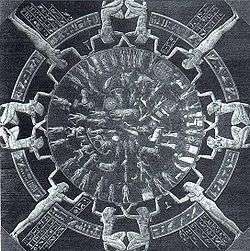 An astronomical ceiling in the burial chamber of Ramesses VI shows the sun being born from Nut in the morning, traveling along her body during the day and being swallowed at night. During the Fifth Dynasty six kings built sun temples in honour of Ra. The temple complexes built by Niuserre at Abu Gurab and Userkaf at Abusir have been excavated and have astronomical alignments, and the roofs of some of the buildings could have been used by observers to view the stars, calculate the hours at night and predict the sunrise for religious festivals. 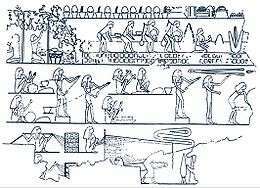 Note however that the observation that a stellar alignment has grown wrong does not necessarily mean that the Egyptians understood or even cared what was going on. For instance, from the Middle Kingdom on they used a table with entries for each month to tell the time of night from the passing of constellations: these went in error after a few centuries because of their calendar and precession, but were copied (with scribal errors) for long after they lost their practical usefulness or possibly the understanding of them. The Edwin Smith papyrus is one of the first medical documents still extant, and perhaps the earliest document which attempts to describe and analyze the brain: given this, it might be seen as the very beginnings of neuroscience. However, medical historians believe that ancient Egyptian pharmacology was largely ineffective. According to a paper published by Michael D. Parkins, 72% of 260 medical prescriptions in the Hearst Papyrus had no curative elements. According to Michael D. Parkins, sewage pharmacology first began in ancient Egypt and was continued through the Middle Ages, and while the use of animal dung can have curative properties, it is not without its risk. Practices such as applying cow dung to wounds, ear piercing, tattooing, and chronic ear infections were important factors in developing tetanus. Frank J. Snoek wrote that Egyptian medicine used fly specks, lizard blood, swine teeth, and other such remedies which he believes could have been harmful. Mummification of the dead was not always practiced in Egypt. Once the practice began, an individual was placed at a final resting place through a set of rituals and protocol. The Egyptian funeral was a complex ceremony including various monuments, prayers, and rituals undertaken in honor of the deceased. The poor, who could not afford expensive tombs, were buried in shallow graves in the sand, and because of the arid environment they were often naturally mummified. Evidence indicates that Egyptians made use of potter's wheels in the manufacturing of pottery from as early as the 4th Dynasty. Chariots, however, are only believed to have been introduced by the invasion of the Hyksos in the Second Intermediate period; during the New Kingdom era, chariotry became central to Egypt's military. The Egyptians developed a variety of furniture. There in the lands of ancient Egypt is the first evidence for stools, beds, and tables (such as from the tombs similar to Tutenkhamen's). Recovered Ancient Egyptian furniture includes a third millennium BC bed discovered in the Tarkhan Tomb, a c.2550 BC. gilded set from the tomb of Queen Hetepheres I, and a c. 1550 BC. stool from Thebes. Some have suggested that the Egyptians had some form of understanding electric phenomena from observing lightning and interacting with electric fish (such as Malapterurus electricus) or other animals (such as electric eels). The comment about lightning appears to come from a misunderstanding of a text referring to "high poles covered with copper plates" to argue this but Dr. Bolko Stern has written in detail explaining why the copper covered tops of poles (which were lower than the associated pylons) do not relate to electricity or lightning, pointing out that no evidence of anything used to manipulate electricity had been found in Egypt and that this was a magical and not a technical installation. Those exploring fringe theories of ancient technology have suggested that there were electric lights used in Ancient Egypt. Engineers have constructed a working model based on their interpretation of a relief found in the Hathor temple at the Dendera Temple complex. Authors (such as Peter Krassa and Reinhard Habeck) have produced a basic theory of the device's operation. The standard explanation, however, for the Dendera light, which comprises three stone reliefs (one single and a double representation) is that the depicted image represents a lotus leaf and flower from which a sacred snake is spawned in accordance with Egyptian mythological beliefs. 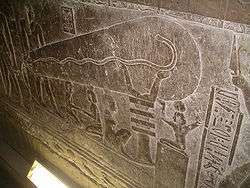 This sacred snake sometimes is identified as the Milky Way (the snake) in the night sky (the leaf, lotus, or "bulb") that became identified with Hathor because of her similar association in creation. Under Hellenistic rule, Egypt was one of the most prosperous regions of the Hellenistic civilization. The ancient Egyptian city of Rhakotis was renovated as Alexandria, which became the largest city around the Mediterranean Basin. Under Roman rule, Egypt was one of the most prosperous regions of the Roman Empire, with Alexandria being second only to ancient Rome in size. Recent scholarship suggests that the water wheel originates from Ptolemaic Egypt, where it appeared by the 3rd century BC. This is seen as an evolution of the paddle-driven water-lifting wheels that had been known in Egypt a century earlier. 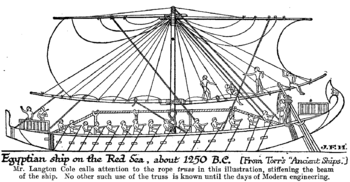 According to John Peter Oleson, both the compartmented wheel and the hydraulic Noria may have been invented in Egypt by the 4th century BC, with the Sakia being invented there a century later. This is supported by archeological finds at Faiyum, Egypt, where the oldest archeological evidence of a water-wheel has been found, in the form of a Sakia dating back to the 3rd century BC. A papyrus dating to the 2nd century BC also found in Faiyum mentions a water wheel used for irrigation, a 2nd-century BC fresco found at Alexandria depicts a compartmented Sakia, and the writings of Callixenus of Rhodes mention the use of a Sakia in Ptolemaic Egypt during the reign of Ptolemy IV in the late 3rd century BC. Ancient Greek technology was often inspired by the need to improve weapons and tactics in war. Ancient Roman technology is a set of artifacts and customs which supported Roman civilization and made the expansion of Roman commerce and Roman military possible over nearly a thousand years. Under Arab rule, Egypt once again became one of the most prosperous regions around the Mediterranean. The Egyptian city of Cairo was founded by the Fatimid Caliphate and served as its capital city. At the time, Cairo was second only to Baghdad, capital of the rival Abbasid Caliphate. After the fall of Baghdad, however, Cairo overtook it as the largest city in the Mediterranean region until the early modern period. Inventions in medieval Islam covers the inventions developed in the medieval Islamic world, a region that extended from Al-Andalus and Africa in the west to the Indian subcontinent and Central Asia in the east. The timeline of Islamic science and engineering covers the general development of science and technology in the Islamic world. ↑ Thomas Little Heath, Manual of Greek Mathematics. Page 11. ↑ A. Lucas and J. Harris, "Ancient Egyptian Materials and Industries" (New York: Courier Corporation, 2012), 48. ↑ A. Lucas and J. Harris, "Ancient Egyptian Materials and Industries" (New York: Courier Corporation, 2012), 64. 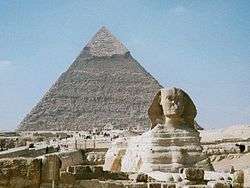 ↑ "What is Civil Engineering: Imhotep". ↑ Arce/Nc Archives Archived October 14, 2007, at the Wayback Machine. ↑ Patricia Blackwell Gary; Richard Talcott (June 2006). "Stargazing in Ancient Egypt". Astronomy: 62–7. ↑ A primary feature of a properly designed sail is an amount of "draft", caused by curvature of the surface of the sail. When the sail is oriented into the wind, this curvature induces lift, much like the wing of an airplane. ↑ Technological Choices: Transformation in Material Cultures. Page 410. ↑ "Abydos Boat". Archived from the original on 2009-10-25. ↑ Blake L. White, Ancient Egypt Provides an Early Example of How A Society's Worldview Drives Engineering and the Development of Science. Strategic Technology Institute. Page 2. ↑ JG Manning, "Water, Irrigation, and Their Connection to State Power in Egypt" (Econ Yale 2012), 8. ↑ "Amenemhet III". Britannica Concise. Retrieved 2007-01-10. ↑ JG Manning, "Water, Irrigation, and Their Connection to State Power in Egypt" (Econ Yale 2012), 9. ↑ Susan Hampton. 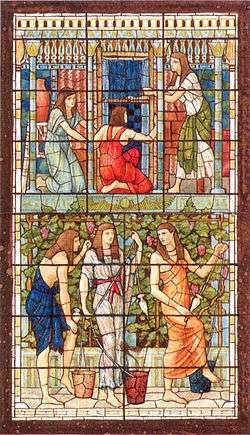 "Glassmaking in Antiquity". The University of North Carolina at Chapel Hill. Archived from the original on 5 April 2007. Retrieved 2007-03-21. ↑ De Santillana, G.; Von Dechend, H. (1977). Hamlet's Mill. David R. Godine. ISBN 9780879232153. ↑ Paul Jordan (2006). "Esoteric Egypt". In Garrett G. Fagan. Archaeological Fantasies:How Pseudoarchaeology Misrepresents the Past and Misleads the Public. Routledge. p. 123. ISBN 978-0-415-30593-8. 1 2 Microsoft Word – Proceedings-2001.doc Archived April 7, 2008, at the Wayback Machine. ↑ "animal dung can have curative properties". ↑ Mamtani R, Malhotra P, Gupta PS, Jain BK (June 1978). "A comparative study of urban and rural tetanus in adults". Int J Epidemiol. 7 (2): 185–8. doi:10.1093/ije/7.2.185. PMID 681065. ↑ Frank J. Snoek (August 2001). "The Mind Matters". Diabetes Spectrum. 14 (3): 116–117. doi:10.2337/diaspect.14.3.116. ↑ Doherty, Sarah (2013). The origins and the use of the potters wheel in Ancient Egypt. (Thesis). Cardiff University. Retrieved 8 January 2016. ↑ Stern, Bolko (1998) . Ägyptische Kulturgeschichte. Reprint-Verlag-Leipzig. pp. 106–108. ISBN 978-3-8262-1908-5. R. J. Forbes, "Studies in Ancient Technology". 1966. Örjan Wikander, "Handbook of Ancient Water Technology". 2000. Patricia Blackwell Gary; Richard Talcott (June 2006). "Stargazing in Ancient Egypt". Astronomy: 62–7. Parker Richard A. "Egyptian Astronomy, Astrology, and Calendrical Reckoning". Dictionary of Scientific Biography. 15: 706–727. David, Rosalie A.; H.G.M. Edwards & D.W. Farwell (2001). "Raman Spectroscopic Analysis of Ancient Egyptian Pigments". Archaeometry. 43 (4): 461–473. doi:10.1111/1475-4754.00029. Earl, Bryan (Summer 1995). "Tin Smelting at the Oriental Institute". The Oriental Institute News and Notes. 146. Gourdin, W.H. ; W.D. Kingery (1975). "The Beginnings of Pyrotechnology: Neolithic and Egyptian Lime Plaster". Journal of Field Archaeology. 2: 133–150. doi:10.1179/009346975791491277. JSTOR 529624. Meyer, Carol; Bir Umm Fawakhir (1997). "Insights into Ancient Egyptian Mining". JOM. 49 (3): 64–8. Bibcode:1997JOM....49c..64M. doi:10.1007/BF02914661. Nicholson, Paul T. and Ian Shaw, eds. 2000. Ancient Egyptian Materials and Technology. University Press, Cambridge. Pulak, C. A (1998). "The Uluburun Shipwreck: An Overview". International Journal of Nautical Archaeology. 27 (3): 188–224. doi:10.1111/j.1095-9270.1998.tb00803.x. Scheel, Bernd. 1989. Egyptian Metalworking and Tools. Haverfordwest, Great Britain: Shire Publications Ltd.
Shaw, Ian. Editor. 2000. The Oxford History of Ancient Egypt. Oxford: Oxford University Press. Shortland, A.J. (2004). "Evaporites of the Wadi Natrun: Seasonal and Annual Variation and its Implication for Ancient Exploitation". Archaeometry. 46 (4): 497–516. doi:10.1111/j.1475-4754.2004.00170.x.